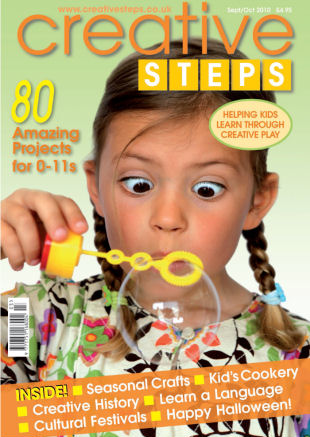 ISSUE 26 is packed with more than 60 great seasonal activities; including early years projects helping with co-ordination, exploration of materials, reasoning and role play, plus ideas to encourage children to explore their favourite books through a range of crafts & activities. There are great autumnal projects, spooky Halloween makes and treats, activities to help celebrate Diwali and Eid, The Big Draw and Art for Kids, Ancient Aztecs, plus big grins for World Smile Day! We’ve more than £1300 worth of the latest great books, games and cool stuff to be won in our free to enter competitions, along with our annual review of the best creative toys and games available. All this, the regular features, Reading Corner, full sized printable templates and clear step-by-step instructions. SWEETS FOR EID – Celebrate Eid with some traditional handmade sweet treats. DIWALI DIYA CARD – A simple Diwali greetings card made from basic crafting materials. SAY IT WITH A SMILE – It’s World Smile Day on October 1st so get everyone smiling with some easy-to-make happy faces. THE HUNGRY CATERPILAR STORY SACK – A whole range of themed activities to illustrate the benefits of sharing books. MARSHMALLOW SKULLS – You’ve never seen marshmallows look like this before! Great for a Halloween party. WORMY SLIME! – A squelchy, slippery actiivty guaranteed to get everyone squealing with delight! HALLOWEEN DECORATIONS – Turn plain paper plates into spooky works of art – great for winter displays. ROCKET FUEL! – An easy-to-make warming veggie soup – perfect for Bonfiire Night. BREADSTICK SPARKLERS – A sweet snack that children will love to make and can’t wait to eat! SPARKLER POTS – Too cold or rainy for real fireworks? Create your own dazzling indoor display. TOFFEE APPLES – Made from balls of newspaper, these toffee apples look good enough to eat! PRINCESS PUZZLES – A fun page of puzzles from everyone’s favourite Little Princess and you can even win her latest DVD! AUTUMN’S HERE! – Celebrate autumn with some great seasonal activities and projects. FLOWERPOT LOAF – A simple, fun recipe to teach children how to bake their own bread. THE BEAR NECESSITIES – September is Bear Necessiities Month so help bears worldwide while having fun at the same time. RANGOLI PICTURE – Learn how to make your own Rangoli pictures as part of your Diwali celebrations. MAKE SOMEONE SMILE! – Another great activity for World Smile Day – guaranteed to put a smile on everyone’s face! MIND YOUR LANGUAGE! – Celebrate the European Day of Languages with games for all abilities. DIWALI SHADOW PUPPETS – Act out the story of Rama and Sita using your very own shadow puppet theatre. AUTUMN LEAVES – Learn how to use watercolours to create a stunning autumn landscape. ANCIENT AZTECS – A colourful creative history feature on the amazing Aztec civilisation. 3D APPLES & PEARS – Teaching children how to work with fabric? This versatile project can be sewn or glued, both with stunning results. POP-UP WITCH – A spooky Halloween pupet – perfect for a half-term group activity. TOADSTOOL MONEY POTS – Turn recycled cartons into cute toadstool pots – perfect for hiding little treasures. CANADIAN PANCAKES – Learn how maple syrup is made and then have a go at making some tasty pancakes. HALLOWEEN LANTERNS – A fabulous group activity that will light up any Halloween party. MONSTER DRAW – Celebrate The Big Draw in October with a monster drawing project.